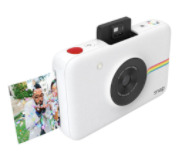 The Polaroid Snap is the perfect blend of nostalgic Polaroid instant photography and modern, digital technology. This pocket-sized device pairs wirelessly to any smartphone or tablet via Bluetooth 4.0 or NFC and uses a dedicated free mobile app available for iOS or Android, allowing you to instantly print 2x3” color photos. The Polaroid Pop instant digital camera is ideal for capturing all of your favorite moments in the 3.5x4.25″ Polaroid border format. Stereo True Wireless Bluetooth Earbuds w/ Aluminum Charging base. The Polaroid PR-B100 is the smallest Bluetooth headset with no wires at all! Polaroid Kids Headphone, developed to protect children's hearing. Polaroid PR-E223BK offers mobile gamers a unique gaming experience, making sounds explode and alive via vibration.